I have a 16 year old car that just reached over 100,000 miles a few months ago. I realized I have not driven it as much and when an opportunity arose for me to head over to Arkansas for an Outdoor Blogger Summit, I decided that perhaps it’s time for me to take my Toyota Echo for a drive. To be honest, I have only driven 5 hours at the most on my own. Other than that, any longer drives were done along the company of friends. From D.C. to Arkansas, it takes 17-18 hours with a total one way mileage of 1200. I ended up deciding to go to Dallas as well to visit family which required almost 20 hours of driving with a one way mileage of 1300. Long drives alone are completely different from my experience of trekking alone for that same amount of time. And, doing a long drive would mean having to be mindful of certain logistics along the way that must be decided upon ahead of time such as where to stop and stay, how long to drive for how many days, the budget for the road trip and even your meals along the way. To help you out with your future long drives, below is a list of things to keep in mind. 1. Get your car ready. The situation varies and the tasks involved depend on the condition of your vehicle. My car is obviously dated so I had to make sure the oil change is recent and the tires and brakes are functional and safe. Make sure to get a mechanic to take a look at the overall status of your car before heading out if it’s an older car. One of the hosts I encountered via AirBnb. 2. Figure out the amount of time you’re willing to drive. Driving is tedious and I had to make sure I can handle the amount of time I allotted for myself to drive each day. In my case, heading to Dallas meant driving over a period of two days with 10 hours of driving each day. That also meant adding two extra hours for pit stops and breaks which amounted to a total of 12 hours per day. Twelve hours is a long day. I started even before sunrise and ended near sunset time or even much later. I gathered from this experience that my maximum time is 10 hours including the pit stops. Anything beyond that is pushing the limits for me. 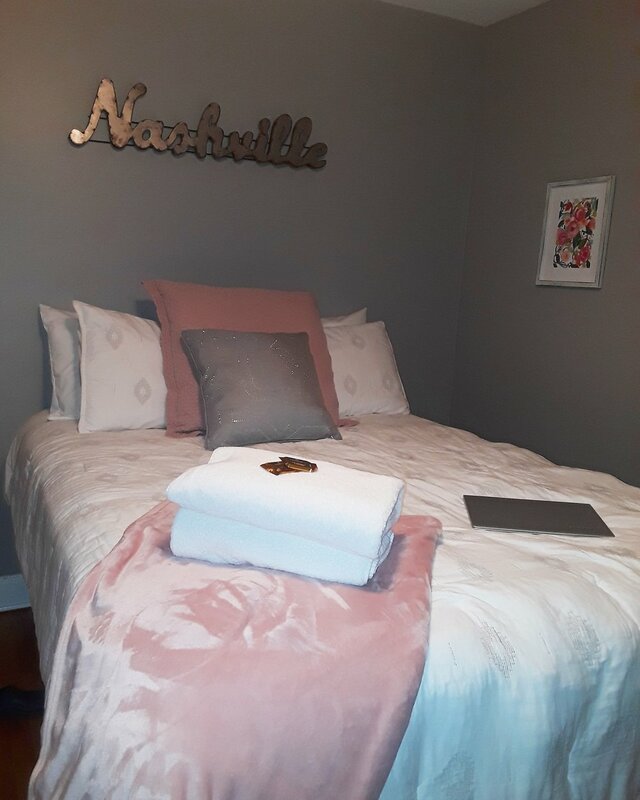 My AirBnb stay in Nashville was a welcome retreat after 12 hours on the move. 3. Where do you plan to stop and stay? This is a two-fold question. First, once you decide how much time you’re willing to drive on the road. Then, find out which city/town would work in terms of the schedule that you set for yourself. In my case, I used Google map to track the endpoint that would be close to the 9-10 hour drive that I’m willing to do. That turned out to be Nashville, TN. Once you figure out the city, you then have to decide your accommodation options. These days you can stay at hotels, motels, AirBnb, hostels and campgrounds. I opted to use AirBnb as the cost was reasonable and the range went from $20 to $35 which is significantly lower than motel rates. Booking a day or two ahead was sufficient for AirBnb. Nashville, TN : Monica's place was cozy as you can see from the photo I took of the room. I was on the road for 12 hours and it was a welcoming experience to find a comfy bed full of pillows, with TV in the room and a beautifully decorated space. The responses from Monica were prompt on questions about directions etc, which I appreciated given the hectic driving that I had to do all day. Hence, she gave me one less thing to worry about. Fayetteville, AR: I thoroughly enjoyed Larry's and Tracey's place in the city of Fayetteville. It's a quiet residential neighborhood. The room gives you plenty of space as it fits 2 beds. I met Tracey and I find her to be warm and welcoming. How could I resist her offer for coffee in the morning? That was the perfect icing on the cake before I headed out to my final destination. Cave Springs, AR: If you're visiting Bentonville, AR, then I highly recommend this AirBnb stay. The house is only a few minutes from the center of Bentonville where I attended a conference for outdoor bloggers so I enjoyed the convenience and minimal amount of driving. The host, Justin, and his furry feline host, were welcoming and I thoroughly enjoyed the zen-like setting and unique decor of the house. Little Rock, AR: For $17 a night, you'd be insane to pass up the chance to stay at Karen's place. It's cozy, clean and well-kept. It's a great pit stop for any long drives. Karen was responsive and made sure I was happy with my stay. I didn't have time obviously to explore the area as I had to drive out the next day but there are plenty of cafes and restaurants nearby and the property is in a safe and quiet location. Knoxville, TN: My last stop was at Suzi's condo in West Knoxville. It's a nicely decorated room with a twin bed, chair & ottoman and a desk. I thoroughly appreciated the desk as a digital nomad since I was able to make use of the desk to do work! It's an adorable townhouse with a nice living room space plus your own private bath. Although I didn't get a chance to meet Suzi, she made sure I have all the information I needed to have an amazing stay. 4. How do you wish to address food? I have to confess - this is the worse part of the trip. Unless you’re a fan of fast food, it’s rather time consuming to find a non-fast food meal of your choosing. As I already had 12 hours to spend on the road, I had to be mindful of the time factor if I end up wanting to go for a specific type of meals. Along the road, the quick options were fast food chains which after the third day of doing the long drive started feeling a bit frustrating. Eating healthy can also be a challenge if you’re looking for decent options as most fast food offerings are lacking in that aspect. 5. Coffee anyone? Consider having good night sleep before driving out. One challenge I found with long drives is the level of exhaustion on my end. There were moments during the drive where I had to stop for a nap for safety reasons as I was totally drifting off (not good, of course). I tried coffee but to no avail. Remember, it’s better to go at a slower pace and stop as needed for safety reasons rather than go in a hurry. Safety after all is the most important part of this endeavor. Make sure you take breaks when needed even if it means you arrive at your destination much later than you first planned. 6. How will you entertain yourself? Boredom is the other biggest challenge. You’re alone. No friend there to keep you entertained. The music on the radio is unreliable at best plus you’re limited to country or Christian music which can be unfortunate if either type of music isn't to your liking. Make sure to plan this out ahead of time if you’re the type who may get bored on a long drive without something interesting to listen to. There are audio books and music on your Ipod to consider for entertainment. Or, you can do what I did - I took advantage of the free time to reflect on things in life and came up with ideas for my business. Whichever way you wish to address this, the point is to help you cope with the silence and the long time you’ll be spending on the road. A reunion with family made it worth the long drive. The care package from the family was icing on the cake. The bottom line with solo long drives is they can be worth the experience especially when it’s your first time to go on such an adventure! If you’re prepared for the nuances and inconveniences along the way, then it can easily be an unforgettable adventure – it’s merely a matter of what you make of it. In my case, I managed to visit family members that I have yet to meet which made the journey much more enjoyable. Be creative with how you execute the drive. Include some sightseeing if you have extra time to do so. You'll soon realize despite the agony of the long drive, it's still worth the time and effort. I'd rather trek 10 hours as opposed to drive that same amount of time. Driving that long is tedious and a bit harsh on the body. In fact, I experienced aches and cramps on my legs. Mentally, I find driving more of a challenge than trekking up a summit in a lot of ways. Plus, the risk of getting in harm's way is higher than trekking. Hence, it takes a lot of mental energy to focus and concentrate which easily leads to a feeling of exhaustion. Solo driving is no easy task. I'm happy to experience it but in my case I'd opt to walk anytime. How about you?